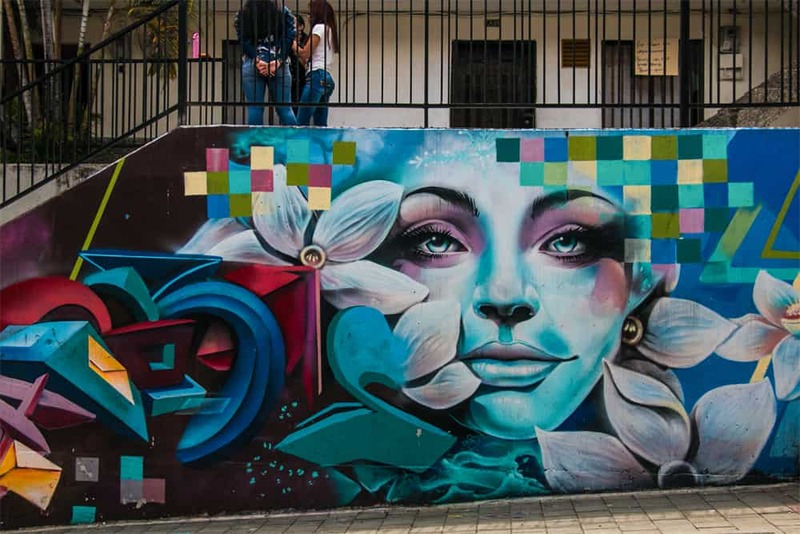 Following five months in Central America, we’d grown quite accustomed to the vibrant colours and beautiful street art in the region. 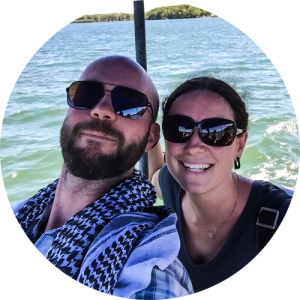 As a result, we had a general idea of what to expect upon arriving in Colombia. 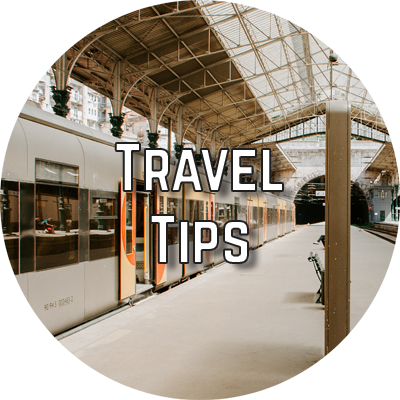 A couple of friends had visited only a few short weeks prior to our entry into the country, and passed on a few tips on where to check out some of the best art. All of that said, we couldn’t have been more unprepared for the level of artwork we would encounter. 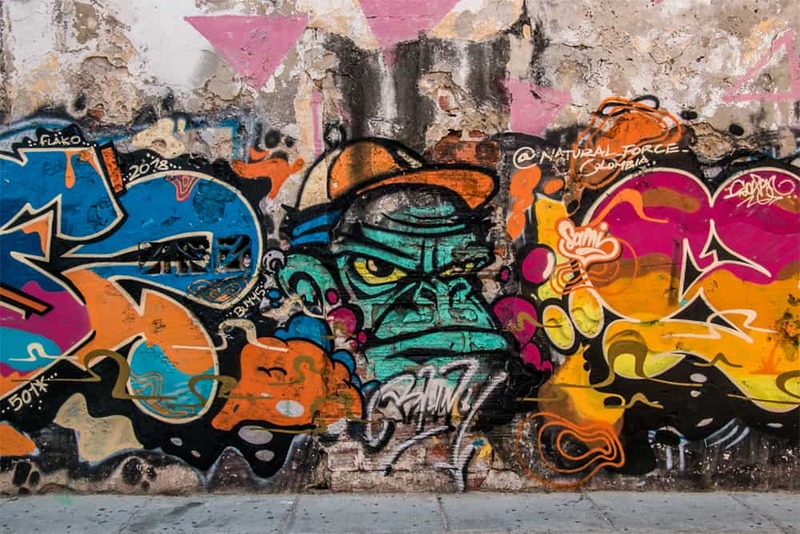 We’ve been fans of quality graffiti for many years, but our exposure has been limited to the odd wall on a handful of cities. It wasn’t until our first visit to London a few years back that we saw any significant amount in a concentrated area. 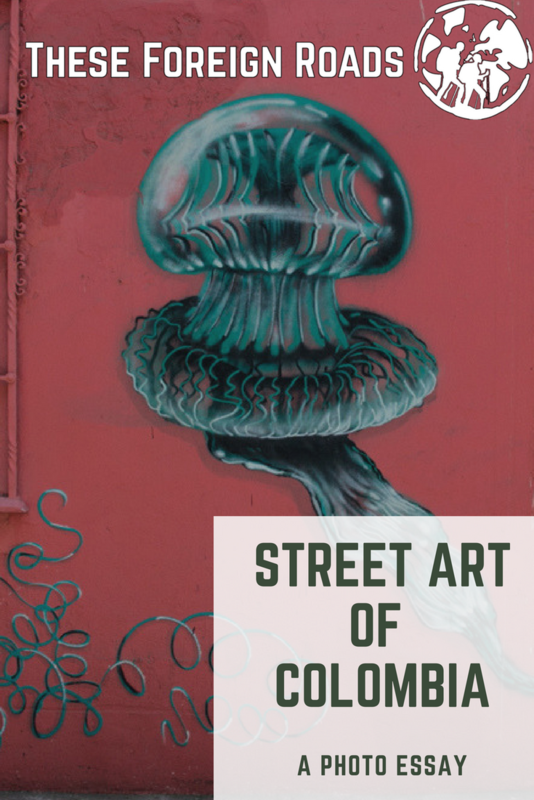 Colombia, specifically Medellin and Bogota, are on a completely new level to anything we’ve seen in the past. 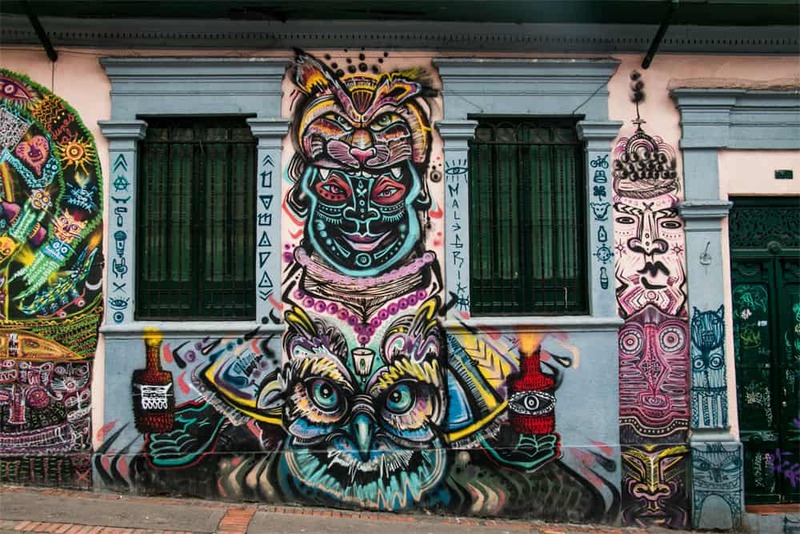 The scene in Bogota is so prolific, there are entire tours dedicated to the graffiti scene. 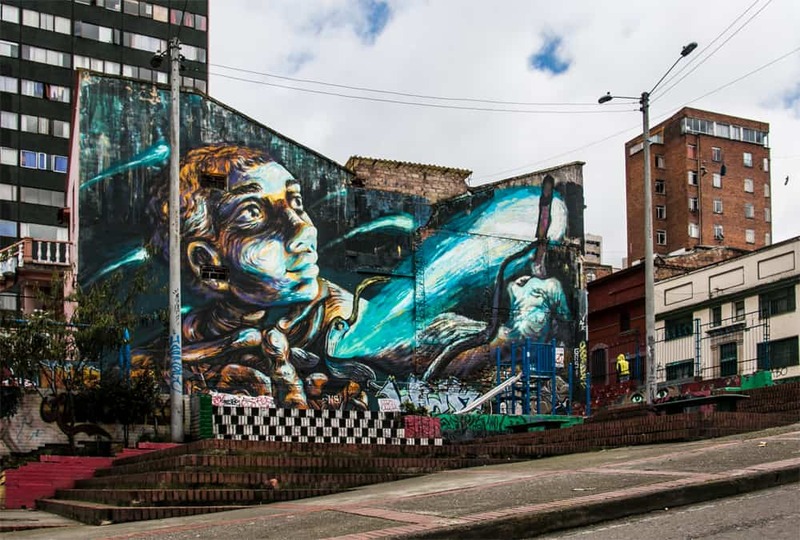 This is one of the first pieces we encountered while taking the Bogota Graffiti Tour. I love this one out of the sheer intricacy in the design. There is just so much going on. From the centrepiece inspired by the natives and traditional culture in the region, to cryptic runes and modern hieroglyphs, it’s a wall I could stare at for hours. Sometimes they’re relatively simple, like this jellyfish we found in Santa Marta. I love this one because even though it appears quite basic on first glance, the layering of colours and shading creates a lot of depth. 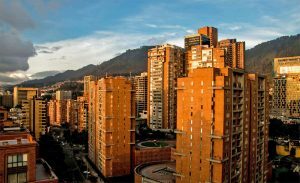 A significant portion of the construction in larger cities like Medellin and Bogota are these standard bricks. Aside from the newer skyscrapers that have appeared in recent years, much of the skyline is this orange-red hue. This piece stands out so vividly against the rather bland background and is a much welcomed sight. 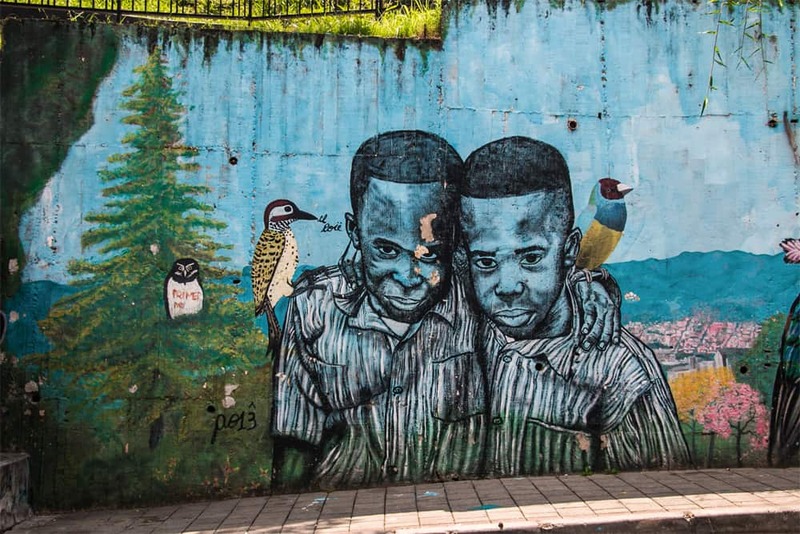 One of the older pieces in Medellin’s notorious Comuna 13, this is one of many works that represent hope for the youth of the troubled neighbourhood. Thankfully, many of the kids in this area are beginning to turn to music and art, rather than gangs and violence. Though it might just be a random collection of famous and unrecognizable cats, done by different artists, there’s one small point that sets this apart. It’s a little difficult to see from this photo, as it was taken from the right location, but note the pole covering the right side of the black cat’s face. Standing in any other spot, the face will be distorted, but from this location, the painted post matches the background almost seamlessly. 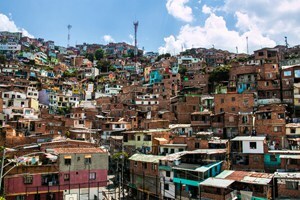 Just like in Medellin, much of the older areas of town feature bland and emotionless colours in their design. This only works to the benefit of artists. With such dull backgrounds, works like this Van Gogh-esque painting explode with life. 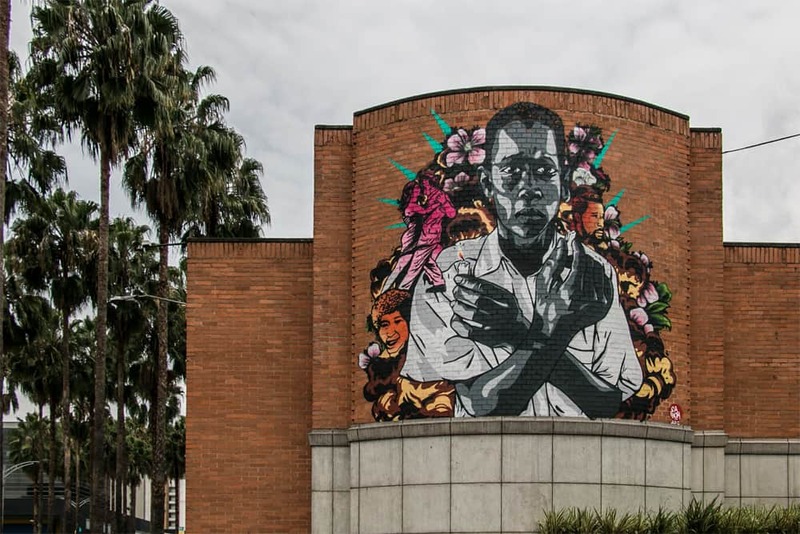 While it’s difficult to narrow down a favourite individual piece, this entire wall is possibly my favourite collection in the country – definitely in Medellin. 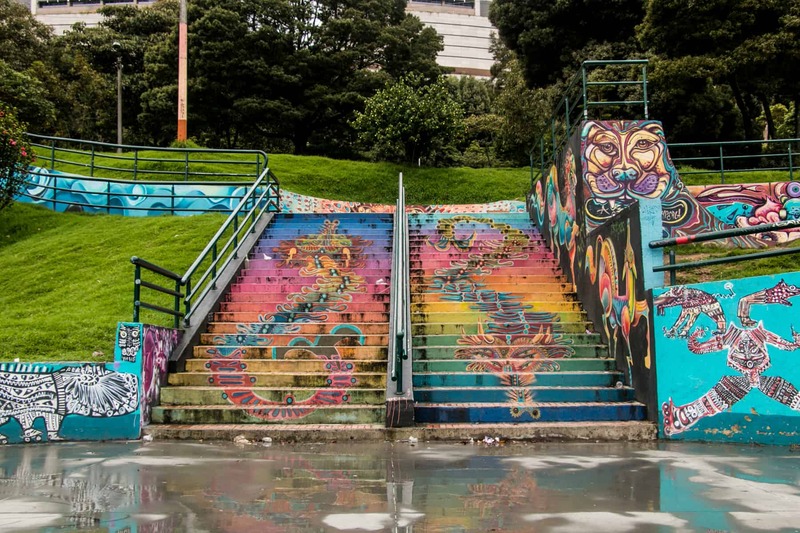 This retaining wall runs along the pedestrian street that cuts through Comuna 13 for roughly a kilometre. You’d be hard-pressed to find a colourless spot along the entire stretch. Although this isn’t as unique or interesting as some of the others, I’m still a fan. While Santa Marta had a few nice pieces around town, it wasn’t until arriving in Cartagena that I saw colours that really popped. This was the first one that grabbed my attention. 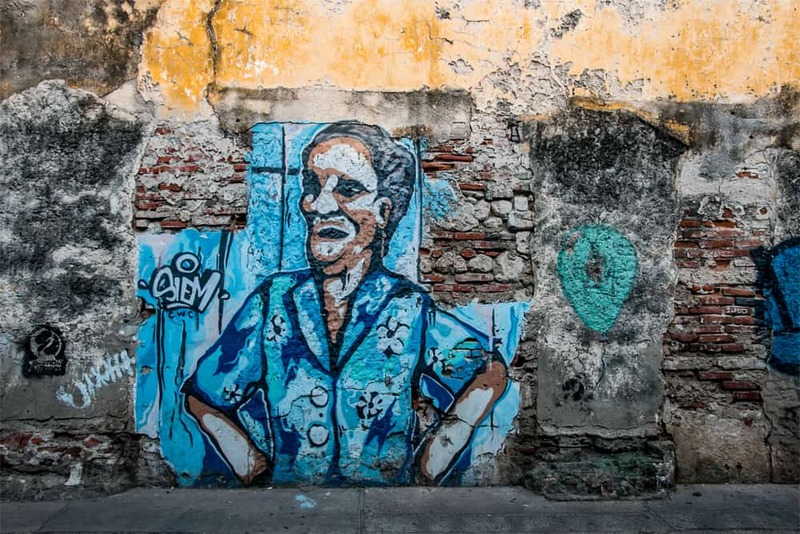 I really enjoy these smaller pieces found all around the Old City in Cartagena. Not to be confused with the ‘Walled City’ a few blocks away, the Getsemani’s walls are far from manicured. Often in a crumbled state of disrepair, there are limited spaces for a smooth canvas. 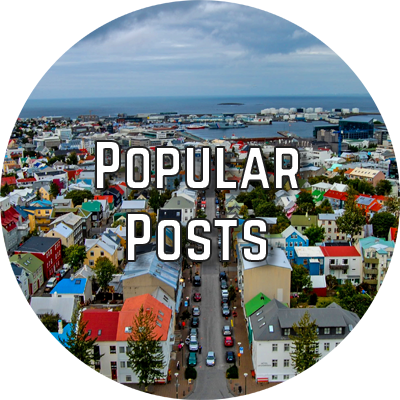 Thankfully, that doesn’t stop local artists from taking advantage of what space they have. 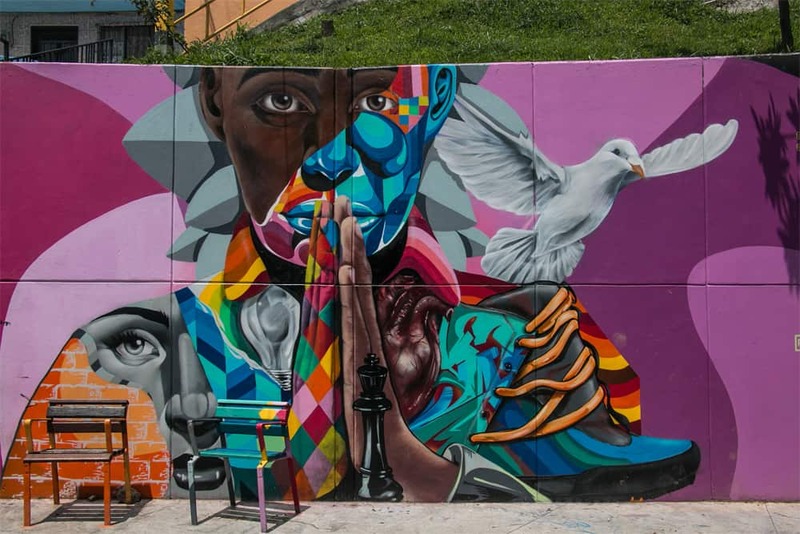 A recurring theme in San Javier, also known as Comuna 13, of peace and hope. A celebration of the relative peace the barrio has seen in recent years, for the first time in decades; and hope for a better future for the next generation. This mural here is the first to greet you upon arrival in the neighbourhood. This is my favourite display in all of Bogota, possibly the best I’ve ever seen. Nearly every square inch of paintable canvas is covered with brilliant, colourful artwork. This is the perfect example of how a simple photo cannot do justice. This entire park, to the right and left of this image, including the benches and a half-pipe, are equally as impressive as the stairs. Wow, I need to go!! 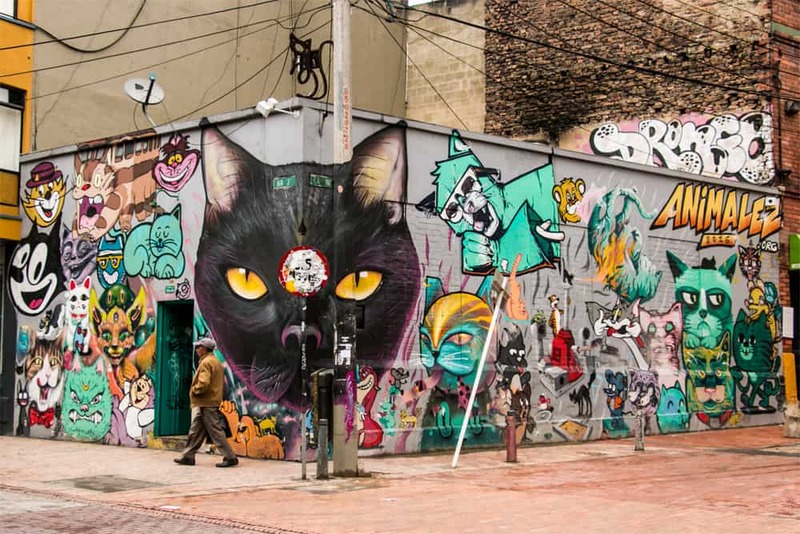 So much cat street art and gorgeous murals!! You definitely should! These are only the 11 I chose to use. 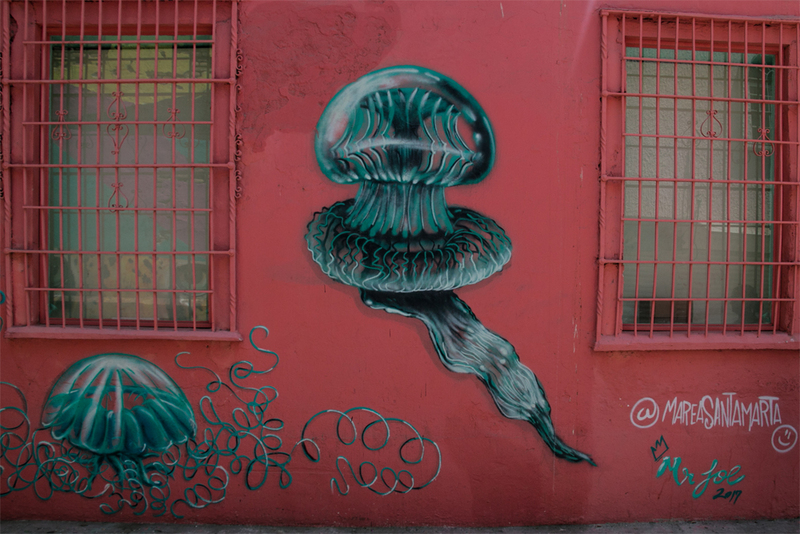 I have well over 100 pictures of stunning graffiti. Mind-blowing country for street art! This is all so beautiful!! Newfound respect for graffiti art. We don’t have much of it around here. It’s so sad how places like Canada have such a negative view towards art in this form.